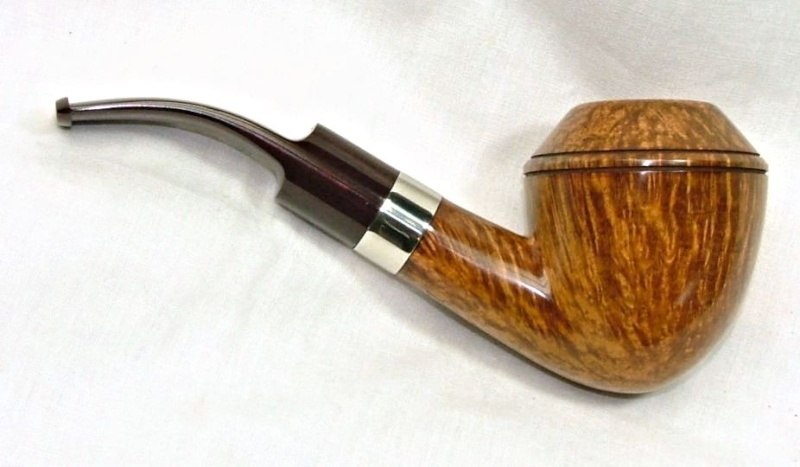 Chenet’s Cake in a slight bend rusticated 1979 Savinelli Estella 310 poker. Running low on this blend. A bottle of Sprite is my drink. Ole Shenandoah No. 76 in a 2003 IMP horn Meer. London Mix in a Pete St Patty 80s bulldog. Enjoyed some more of the '09 McC Club Selection Rich VA Ribbon after work today in the Ser Jac Poker. Got a few more bowls of this to go, from my BoB bombing. Arcadian Perique in a 2003 smooth Peterson Sherlock Holmes Series Baskerville. Dark Star in a Boswell Poker. Part way through this bowl of Capstan Blue in a straight sandblasted black billiard 2013 PSF POY Kaywoodie with an amber colored lucite stem. Model Match in an early Radice Tiger Eye G medium bend pipe with a bamboo-style carving on the shank. Peretti's Royal Blend in my Todd Harris Rhodesian/Calabash. About to smoke Sutliff B26 Dark Honey & Berry Cavendish in a 2002 IMP smooth full bend egg shaped meer. A third of the way through this bowl of Chatham Manor in a black 1997 Brebbia Jubilee 925 silver banded grain sandblast briar calabash. Part way through this bowl of Angler's Dream in a slight bend 1984 Stanwell Antique 124 grain etched with a smooth front. Dunhill Flake in a GBD Fantasy bent bulldog. Just finished smoking Bourbon Street Match in a 2013 medium bend Spillproof corndog cob. Next is SWRA in a straight black sandblast undated Savinelli Hercules 115EX pot. HU Fayyum Blend in a Jesse Jones rhodie. Sweet Rum Twist in a sandblasted Ser Jacopo bent Dublin. Wessex Red Flake in a 1979 brown grain etched Lane Era Charatan's Make medium bend double comfort stem calabash shape 483DC. McClelland Blakeney’s Best Tawny Flake in a 1984 three quarter bend medium brown Ascorti KS Business Dublin.